Hello! It’s Ginger from Ginger Snap Crafts! 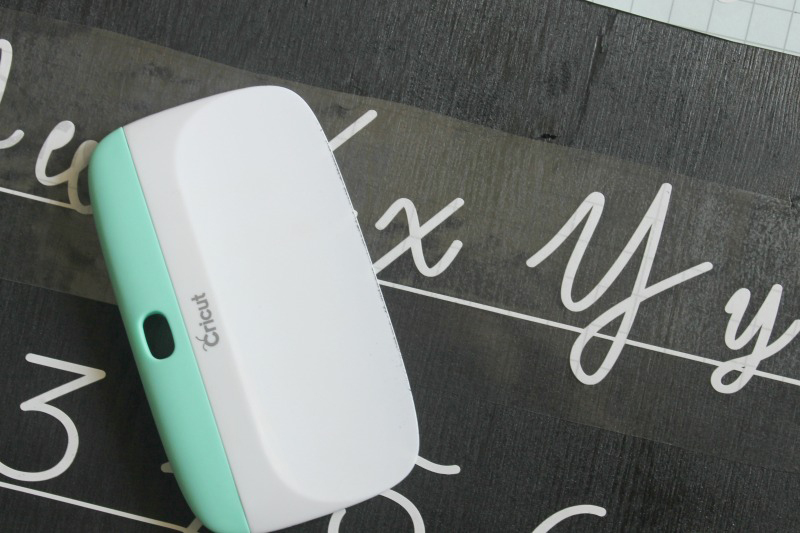 I am so excited to be back here on the Cricut blog sharing a brand new Cricut tutorial with all of you! Huge farmhouse signs are so popular right now, and you might be wondering how you can make a huge sign when your Cricut machine can only cut 12x24 inches? 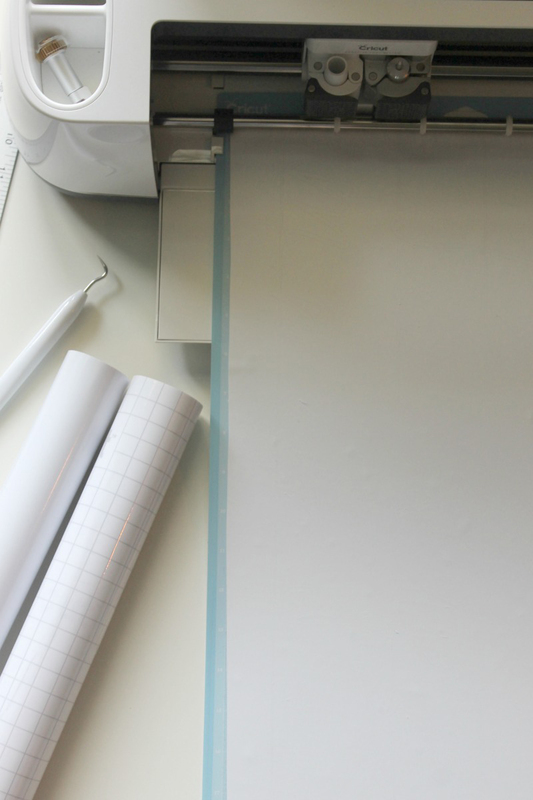 Today I am excited to show you how I made this huge (3 ft by 2 ft) sign using my Cricut Maker. Let’s get started! Annnnnd soon you’ll be designing your own huge farmhouse signs, too. I shared the link to the cut file above, but I also wanted to show you how I designed this cut file, so you can create your own customized giant vinyl signs as well. To design this cut file I used two Cricut fonts, Emiline and Cricut Stretch. Both of these were free for me to use since I have a Cricut Access membership. I highly recommend getting a membership. You will get access to thousands of Cricut images & hundreds of fonts plus 10% off your purchases on Cricut.com. It’s an amazing deal! Alright, let’s get to that tutorial. First, I made the line that runs underneath each group of letters. There are several different ways you could do that. I just inserted a square shape onto my canvas. Then I clicked the unlock button on the bottom left-hand corner. Then I adjusted the size until it looked just right. Tip: Copy & paste this line to use on each row of the alphabet. Next I typed in my first line Aa Bb Cc Dd using the Emiline font. Use the letter space feature to spread the letters out to fit your space. I wanted each line to roughly match up. Since some lines had 4 letter pairs & some had 5, I just eyeballed it until the letter spacing matched the line below. As I typed out each line, I used the weld tool to weld just that line together. Tip: You will need to weld each line separately. If you hit select all & welded everything together at once, the design would be much too big to fit on your Cricut cutting mat. I used the grid lines in Design Space to make sure everything was spaced exactly how I wanted it. 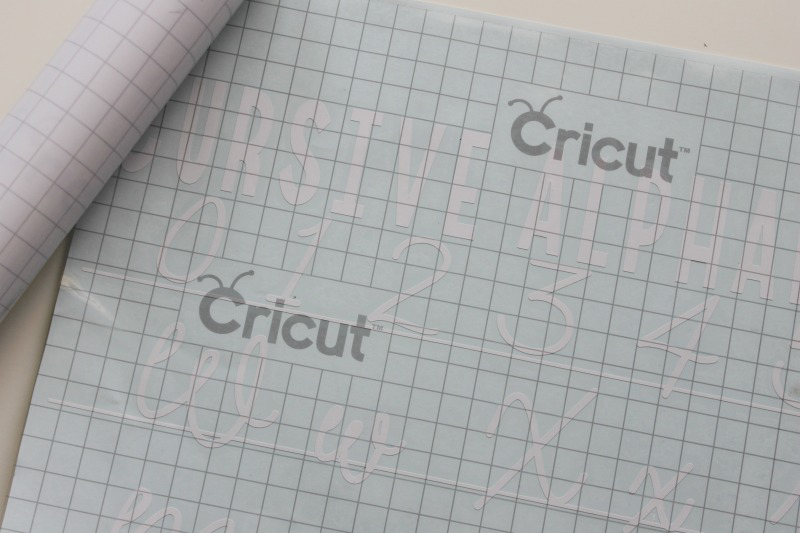 FYI: Cursive Alphabet is written using the Cricut Stretch font. To make sure this design would perfectly fit my sign I inserted a square shape & sized it to 36 inches tall by 24 inches long (the size of my board). Use the zoom out button to zoom out as far as possible. It’s in the bottom left corner of your screen. Then I adjusted my words to fit that space. Then I just deleted the huge square. Now it’s time to cut! You’ll send this design to your Cricut Maker to cut out. Surprisingly, it only took two 12x24 inch pieces of vinyl to cut this whole design out! 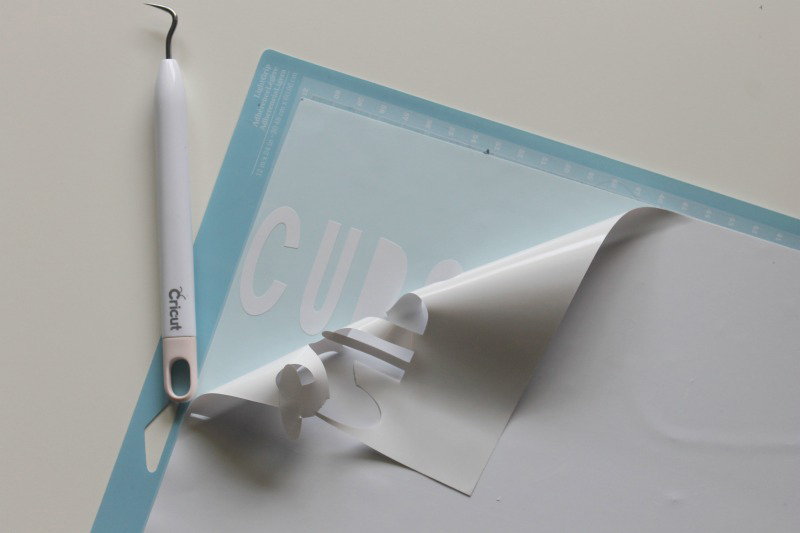 After you cut out the design, you will carefully weed out the excess vinyl. Use the hook tool to remove any small pieces. Next, you will put a piece of transfer tape over your weeded vinyl. Cut each line of your design apart. Remove the backing paper & place the vinyl where you’d like it to be. I just eyeballed my placement. It doesn’t have to be perfect. Gently rub the vinyl in place. 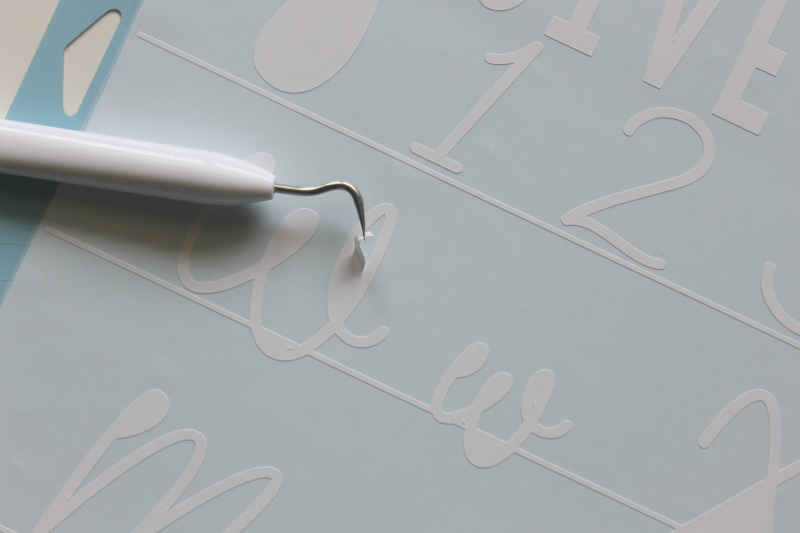 Then carefully remove the transfer tape leaving the vinyl letters behind. 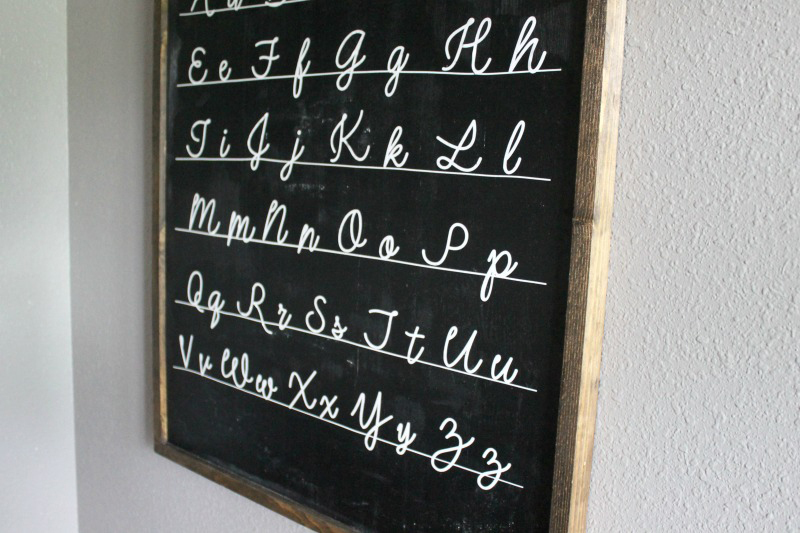 If you notice, mine is not spaced perfectly or in a perfectly straight line but overall it adds to the vintage farmhouse chalkboard style that I was going for. To make this sign look like an actual chalkboard I rubbed a piece of chalk in the corners & around the edges to make it look chalky. 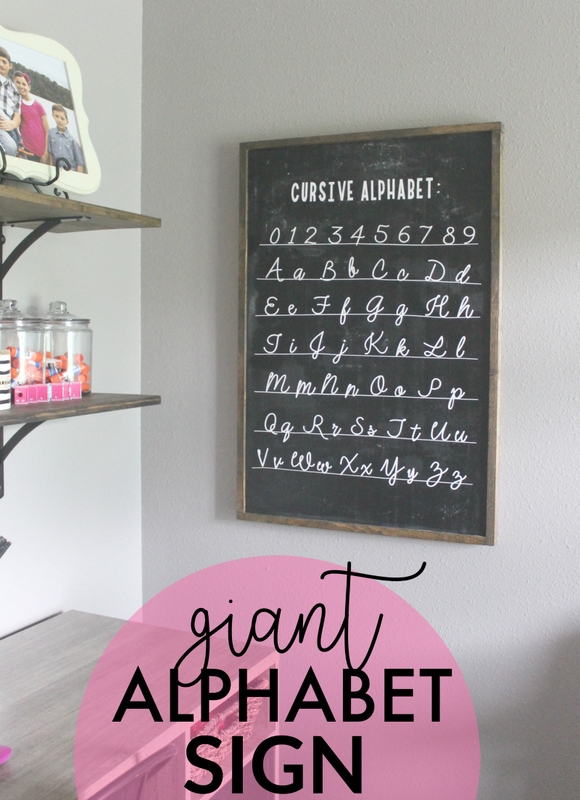 Have you ever tried to make a giant sign in your home? I love being able to customize areas in my home with my Cricut! 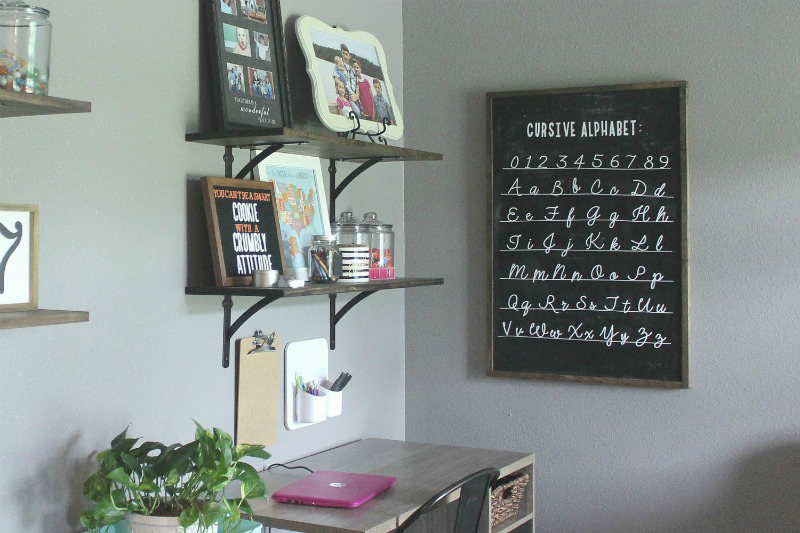 Let me know if you try out this giant alphabet sign in your home. I’d love to hear how it goes!